The protection of peatland ecosystems, which store “disproportionate” amounts of carbon, is vital to achieving Indonesia’s emission reduction targets and climate goals. 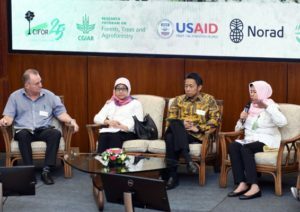 The need to protect remaining peatlands while restoring degraded lands resounded throughout the Tropical Peatlands Exchange, held at the Center for International Forestry Research (CIFOR) headquarters on Aug. 8, 2018. 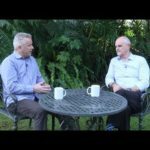 Peatland ecosystems are critical for biodiversity, ecosystem services, water regulation and pollution control, in addition to their “disproportionate importance in terms of carbon storage,” said CIFOR Director General Robert Nasi. Because of this, peat swamps, along with mangroves, have the greatest potentials of any ecosystems to affect greenhouse gas emissions if they are degraded or destroyed. Though only 3% of the world’s land area is covered by peatlands, these areas hold 30 to 40% of global carbon, a density that underscores their importance and the vested interest in their preservation. With Indonesia being home to some of the world’s largest peatland areas, the country can significantly impact both regional and global environments, markets and livelihoods through its peatland management decisions. A case in point concerns the 18th Asian Games ongoing this month, for which Indonesia appears to be going to great measures to ensure that host cities Jakarta and Palembang will not be marred by haze from the country’s perennial forest and land fires. With new and concerted efforts to avoid anything akin to a repeat of the country’s catastrophic fire period in 2015, the coming weeks will put fire prevention and mitigation strategies – many focused on peatlands – to the test. The event aimed to provide recommendations and data to support Indonesia’s policies and goals related to its peatland ecosystems. The country’s nationally determined contribution (NDC) to the Paris Agreement targets a 29% reduction in carbon emissions by 2030, or 41% if provided with external assistance, which some have described as ambitious. The Indonesian Ministry of Environment and Forestry’s Climate Change Mitigation Director Emma Rachmawaty said that Indonesia’s NDCs could be achieved by implementing mitigation actions across four areas – reducing deforestation; reducing degradation; rehabilitation of forest and land; and peatland restoration. If all stakeholders complied with existing government regulations, Rachmawaty posited, the country could be confident about achieving its targets by 2030. Several speakers recalled the forest fires of 2015 – an El Niño year – which caused haze that blew across a number of Indonesian provinces as well as Singapore and Malaysia, prompting a global conversation on the effect of peatland fires on human health, economies and the environment. Because peatlands are not specifically accounted for in carbon budgets, CIFOR Principal Scientist Christopher Martius said, “climate change amplification” could also result from such peat destruction. 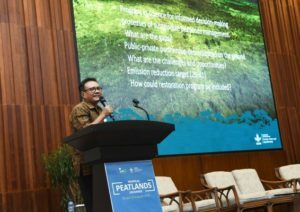 In a session on peatlands and climate change, Solichin Manuri, Senior Advisor at consulting firm Daemeter, said that the 2015 events pushed Indonesia to commit to reducing the impact of recurrent peat fires and restoring degraded peatlands, leading to numerous efforts including the release of a new government regulation in 2016. Nevertheless, this takes time, and Manuri stated that almost 40% of emissions from Indonesia’s forestry sector still come from peatlands. This figure excludes emissions from peat fires, which would make peatlands an even more significant emissions source. Siak district in Riau province, which is home to one of the last large peatland forests on the island of Sumatra, was identified in 2016 as a target area for establishing an exemplar green strategy. Siak is “a district that encourages sustainability and sustainable principles in the utilization of natural resources and economic empowerment of the community,” said Arif Budiman of Winrock International, affirming a thread that ran throughout the Exchange of the need to balance preservation and restoration with sustainable management approaches. 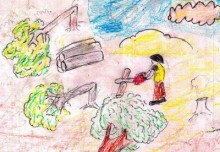 This involves changing people’s behaviors, said Nyoman Iswarayoga of Restorasi Ekosistem Riau (RER), which initiates field schools to educate communities to move away from slash-and-burn techniques in areas where this has been the traditional mode of land-clearing. Such efforts, of course, cost money, and there remains a need to synchronize national plans at regional levels, to help to attract investment. This was addressed in the second plenary of the day, which looked at subnational peatland initiatives, raising the gaps between national mandates and subnational implementation capacity. The speakers called for more ways for Indonesia to take advantage of global agreements that bring in resources that can help the country overcome these hurdles of jurisdiction, among others. Local communities need support to sustainably generate value from peatland resources – and capture this value – CIFOR Scientist Herry Purnomo emphasized during a session on community engagement in peatlands conservation and restoration. However, policies pertinent to this issue remain weak. Communities currently continue to use fire for agriculture in Riau, South Sumatra and Central Kalimantan, showing the need for business models that promote sustainable, peatland-based livelihoods. “Humans are an integral part of peatland ecosystems, so community engagement in the process of peatland restoration is necessary,” concurred Hesti Lestari Tata, Senior Researcher at the Ministry of Environment and Forestry’s Research, Development and Innovation Agency, while raising the ‘3R approach’ of rewetting, revegetation and community revitalization. To optimize benefits for locals, peatland restoration and livelihoods must ultimately be combined. In reference to this, Purnomo raised his research in Riau on common peatland commodities, including sweet corn, spinach, pineapple, betel nut, oil palm, coconut and rubber. The results indicated that certain alternative uses of peatlands – barring oil palm plantations – can create sustainable business opportunities for communities. Concluding the event, CIFOR Principal Scientist Daniel Murdiyarso highlighted stakeholders’ common objectives for emissions reduction targets and peatlands’ role therein. 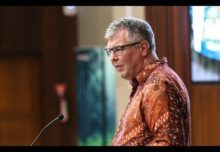 He outlined opportunities for collaboration on peatlands work, highlighting the new global peatlands center expected to be established in Indonesia in the near future. In the case of the Asian Games, it indeed appears that both governments and the private sector are concerned about the possible effects of peatland fires on the event – as well as about peatland destruction and degradation more broadly. 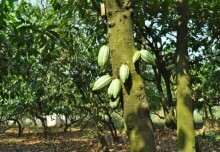 “We need to provide evidence – science-based evidence – to make proper policy on how to avoid and improve situations like degraded peat,” Murdiyarso said, expressing his hope that the Exchange had provided a platform to improve the communication of scientific progress, inform decision-making processes, and enhance public- and private-sector cooperation. Now, when looking at how Indonesia will meet its emissions reduction targets at a national level, the question is whether a dedicated peatland restoration agenda will be part of it. 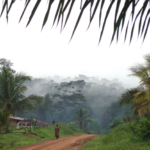 By Hannah Maddison-Harris, originally published at CIFOR’s Forests News.